The next morning I packed up a fresh set of Elixers and my string changing kit and took them in to the studio with me. The kit consists of a Dewalt gyro-controlled powered screwdriver, a Stew-Mac Zapit tuning key adapter, a pair of side cutters, and a manual string winder with a bridge pin puller, all packed into a handy spare mic bag. For this job, that Dewalt powered screwdriver is the greatest thing since sliced bread. You just sqeeze the trigger and rotate your wrist in the direction you want to go. The more you rotate, the fast it goes. 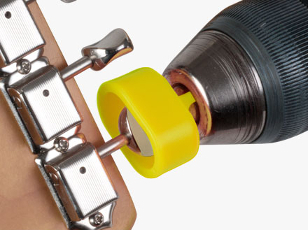 The StewmMac Zapit adapter is made of soft plastic that protects your tuning keys. I rarely need the pin puller on the manual winder but I keep it around in case the odd pin has tightened enough that I don't want to risk a nail. Sure enough, in this case there was one tight pin. But the real subject of this post is the fifth tool: When I got to the studio I popped the Taylor case up on the producer's desk at work, like in the top picture above but with the guitar lying flat in the case. Next, I opened up the neck box. 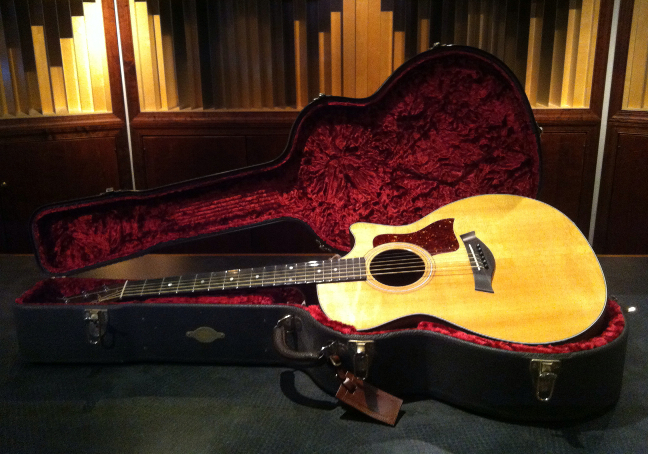 On a Taylor case the neck box cover is hinged at the headstock end so it opens up towards the top. You can open the neck box and set the neck on it as a handy support while you do chores like this. The weight of the neck holds everything securely. But the big thing here was how the guitar was positioned at chest level on the producer's desk. I'd never done a change with the guitar up that high. I was amazed at how much better access I had to everything when the guitar was on a secure surface at chest level. Wow! Things went really quickly. Without any particular haste I was able to replace the strings in eight minutes. That's never happened before. It makes me want to build a chest-high work surface in my guitar room for strings changes. * For this song he tuned the guitar down a half-step to E flat and set the capo at the second fret over all the strings except the low E. When you fret a chord normally the guitar acts like it is in concert tuning but when you go open on a D, it behaves like it is in drop-D duning. As a result of tuning down, the song sounds in the key of F# when you fret and play a G chord as usual above the capo. The partial capo trick is how he is able to sound a regular root G chord shape as the F# I chord yet use the D chord shape over low E in the bass as C# over C#2, making the V chord in the song with the bass V (C#2) lower than the tonic F# for an inversion. Slick!!! !